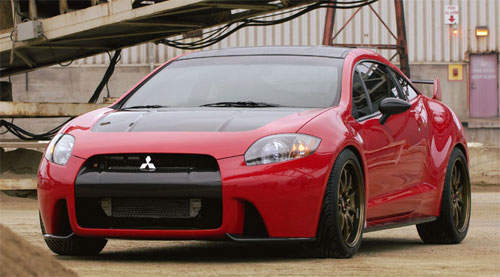 Mitsubishi showcased the 2006 Mitsubishi Eclipse Ralliart at the 2005 SEMA Show this year. The Eclipse is kitted up with a turbocharged 2.0 litre engine, aftermarket enhancements, bodykit and a Ralliart theme paintwork. 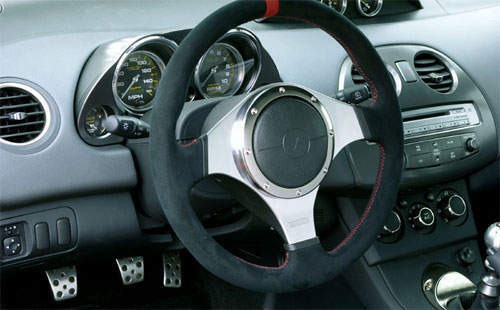 The Eclipse Ralliarts receives the 4G63 turbocharged 2.0 litre putting from the Lancer Evolution. A custom air intake and HKS performance parts boosts power up to 400 horsepower. Those horses are transferred to the wheels via an all-wheel drive system also from the Lancer Evolution through a 6-speed manual transmission. Wheels are 20″ carbon fibre rims wrapped with Yokohama AVS Sport tyres. The entire body has alot of carbon fibre used in it, like the roof, hood and fenders. 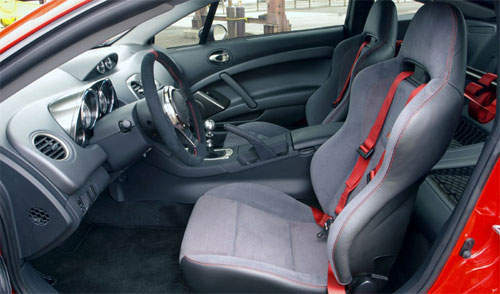 The Ralliart Eclipse comes in Hot Red Mica, specially formulated for this Ralliart edition. 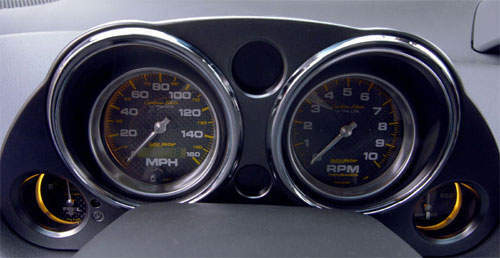 I was wondering why the gauges looked so familiar then noticed all the gauges on this car are from Auto Meter, taken from the Carbon Fibre sports series. I prefer the Cobalt series though. But these ones are nice as well.